Thursday, August 2: Characters from artwork in historic Hyde House are brought to life in a whodunit murder mystery created in partnership with Art in the Public Eye (APE). Try to solve the mystery, learn a little art history, and experience a lot of dramatic flair in Clue at The Hyde, an evening of thrills, laughs, and gorgeous art. The script is written by Tim Gonyea and directed by APE board member Aaron Lambert. Admission is $15 for members and $20 for non-members. Reservations are first-come, first-served; this one will fill up quickly! Thursday, August 9: In more than twenty years painting en plein air, Ann Larsen has logged a lot of miles, traveling from Maine to California for inspiration. In Plein Air: Perception and Passion, the Oil Painters of America signature member will share stories about her work, her travels, and how the art world has changed throughout more than three decades as a working artist. The lecture is the opening event of The Hyde Collection&apos;s inaugural Plein Air Festival, which runs through Sunday, August 12. Sixteen exceptional artists selected by Larsen, guest juror of the festival, will paint throughout Glens Falls, competing for Best of Show and honors in nocturne, waterway, streetscape, historic buildings, and outdoor still life categories. The festival — inspired by complementary exhibitions opening August 5 at The Hyde, Jane Peterson: At Home and Abroad and Changing the Landscape: Women Impressionists from the Thomas Clark Collection — culminates at the Museum&apos;s annual free Community Day celebration Sunday, August 12. The artists&apos; completed artwork will be displayed throughout the day and at 3 pm, awards will be given in each category. Artists from the community are also encouraged to create their own plein air works; to participate, register with collaborative partner Plein Air Adirondack. Larsen is a prominent plein air artist who studied at the Rhode Island School of Design and has worked professionally for more than thirty-five years. She has earned numerous awards from national organizations, including the Award of Excellence at Oil Painters of America, Eastern Regional 2016; the Masters Signature Silver Medal at the American Women Artists National Competition in 2016; Best Landscape, American Women Artists National Competition in 2017; and the Award of Excellence given by Quang Ho at the Paso Robles Invitational in 2014; among many others. She was invited to participate in the Artists for the New Century Exhibition at Bennington Center for the Arts; Sedona Plein Air Festival; Grand Canyon Plein Air on the Rim; Rocky Mountain Plein Air Painters&apos; Plein Air for the Park; Grand Teton Paint Out and Exhibit; and the Paso Robles, California, Signature Invitational. She has juried several shows online and in person. Plein Air: Perception and Passion is $5 for members and $8 for non-members. 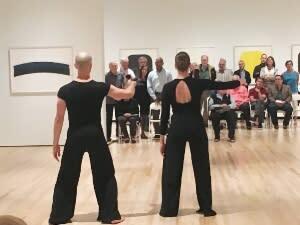 Thursday, August 16: Art and Yoga is going Beyond the Practice. Get a closer look at the newly opened Jane Peterson: At Home and Abroad exhibition — an examination of the artist&apos;s journeys around the world, through experimentation in art movements, and facing the challenges of female artists in the early twentieth century — with a gallery talk by Museum Educator Jenny Hutchinson, also a painter. Then, find your Zen among Impressionist artworks under the guidance of yoga instructor and artist Kate Patterson. Art and Yoga at The Hyde all started with Hyde Night Out. The series has informed programming at the Museum: When one program experiences incredible success, it inspires other events like it. Art and yoga sessions have been offered regularly since being introduced the first year of Hyde Night Out. Admission to Beyond the Practice is $15 for members and $18 for non-members. Space is limited, so early reservations are recommended. Hyde Night Out programs start at 6 pm and provide new ways for the community to interact with the Museum and its collection. To register for any of the Hyde Night Out programs, contact Kayla at 518-792-1761, ext. 310, or adminassist@hydecollection.org. The Hyde Collection is one of the Northeast’s exceptional small art museums with distinguished collections of European, American, Modern, and Contemporary art. Its permanent collection of nearly 4,000 works spans centuries and consists of paintings, drawings, graphics, sculpture, furniture, and decorative arts. The core collection, amassed by Museum founders Louis and Charlotte Hyde, includes works by such European masters as Sandro Botticelli, El Greco, Rembrandt, Peter Paul Rubens, Edgar Degas, Georges Seurat, Pablo Picasso, and Pierre-Auguste Renoir, and Americans Thomas Eakins, Childe Hassam, Winslow Homer, and James McNeill Whistler. The Museum’s collection of Modern and Contemporary art features works by Josef Albers, Dorothy Dehner, Sam Gilliam, Adolph Gottlieb, Grace Hartigan, Ellsworth Kelly, Sol LeWitt, George McNeil, Robert Motherwell, Ben Nicholson, Robert Rauschenberg, and Bridget Riley. The Hyde Collection presents changing exhibitions in its five galleries, as well as lectures, cultural events, family activities, and school programming in its modern museum complex and historic house at 161 Warren St., Glens Falls. Coinciding with the 2018 Saratoga Racing Meet, Horse and Rider explores the relationship between man and beast in the contexts of sport, pleasure, and work. The exhibition includes sculpture, prints, oil and watercolor paintings, and photographs by Edgar Degas, Frederick Remington, Henri Cartier-Bresson, Anna Hyatt Huntington, Wilke, James Brooks, and Danny Lyon.